Who knew filing could be so glamorous? Available in Bold Basics design, these Write-On Expanding File Jackets help you divide and organize projects. Give your documents a stylish place to call home and instantly upgrade your way of organizing. Who knew filing could be so glamorous? Available in Bold Basics design, these Write-On Expanding File Jackets help you divide and organize projects. The multi-colored Bold Basics fashion design is featured on the front of the file jacket. Amber orange, charcoal gray and lime green are the corresponding solid colored backs. Designer v-cut front provides easy access to documents. The full-length tab features write-on technology for easy identification and organization of folder contents. Works with pencil, ball point pen or permanent marker. Sealed on three sides with 1 inch expansion. 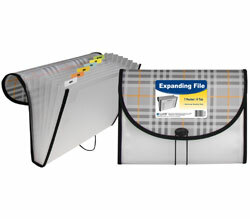 For 8-1/2 x 11 size document storage. Acid-free polypropylene. 6/PK. Hi! I'm Cheryl with C-Line, and I love fashion. Today we're going to talk about our Write-On File Jackets in our new Bold Basics Fashion Collection.Fashion is fun and C-Line keeps your projects organized with a unique pop of color in these fashionable designs. C-Line's file jackets are made from acid-free polypropylene and are perfect for organizing and dividing your letter-sized documents with style. As part of our Bold Basics Fashion Collection, there are three different designs, each with a patterned front, solid back, and a designer v-cut, which provides easy access to the paperwork inside. The file jackets are sealed on three sides with a 1 inch expansion, and will hold up to 200 letter-sized documents. The full-length tab gives you plenty of room to label the contents for easy identification. Simply use a pencil, pen, or permanent marker to label your project. Bold Basics Write-On File Jackets are excellent for organizing information and for storing school projects, reports, paperwork and more. They're a fashionable way to organize your home, school and business. Order yours now! That's all we have for today. I'm Cheryl with C-Line. Thanks for watching.